We’ve all had those days. You know, sloth days that you have absolutely no desire to physically exert yourself whatsoever. When a Netflix marathon sounds more tempting than an actual marathon. The afternoons you’d rather be lounging than lifting. I’ve religiously bounced my booty at Zumba classes for a couple months, switched to intense cardio Pinterest workouts for a winter, then tried to become a runner—boosting my PR to 4.5 miles! The past few months, I’ve been bossing weights with a bit of fast-paced cardio on the side. In my time test-driving a variety of exercise routines, I’ve learned a couple of golden rules for keeping myself motivated. Here are ways I keep my fit life motivation high: Set goals: Before you slip your toes into those sneakers, you need a solid goal. And it better be more impressive than losing 3 pounds. Answer questions like this: What do I want to improve? (Lean muscles, toned muscles, VO2 max, what’s my overall goal?) What changes do I want to see in my physique? What exercises do I enjoy? After deciding what drives you to work out, you can make 3-month, 6-month, even yearly goals to push you toward achieving your all-encompassing mission. You could even make a chart with sneaker clipart and golden trophy stickers to keep yourself on track. Here’s some fitness log Pinspiration, should you need it. Set a habit and don’t stray: I always stop at the gym on my way home from work. That way, driving to the gym is never a valid excuse not to go. Plus, it feels more like running a simple errand than the enormous undertaking of dragging myself out of the house, into the car and driving there. Also, I know exactly which days and times I schedule for working out, so I don’t have to go through the whole “Well, I just need to work on this one blog post before I exercise and after that…” then find myself eating in front of the TV an hour later. Set absolute days/times that you workout and don’t flake out! Wear amazing clothes: Seriously! Wearing an outfit you love has been proven to make people feel more confident and motivated when exercising. What parts of your body do you love? Find clothes that flaunt it! Personally, I’m a huge fan of a bright, open-backed tank top with dark yoga pants. But, beware, beware the see-through garb. I’ve seen far too many ladies’ tushes at my gym fall victim to transparent pants. Not all my male friends feel the same way I do apparently: Find a way to hold yourself accountable: Currently, my method of accountability is having Brian as my partner. Having a workout buddy is a crazy easy way to lock in your commitment. Others choose to blog about their fitness endeavors, which works just as well! Maybe even creating a reward system would work for you. Every 15 workouts completed = shopping for a new gym outfit. Either way, make sure you’re held accountable for a good, hard sweat. Switch up your workout routine: Generally, weight trainers suggest that you switch up your routine every 6-8 weeks. If you’re in a plateau where you’re no longer improving, it’s time to switch it up. Maybe you need to switch up your jogging route to saturate your sight with stimulating new scenery. Even slightly altering a routine every month or two will ensure that your interest and excitement to get fit doesn’t dwindle. 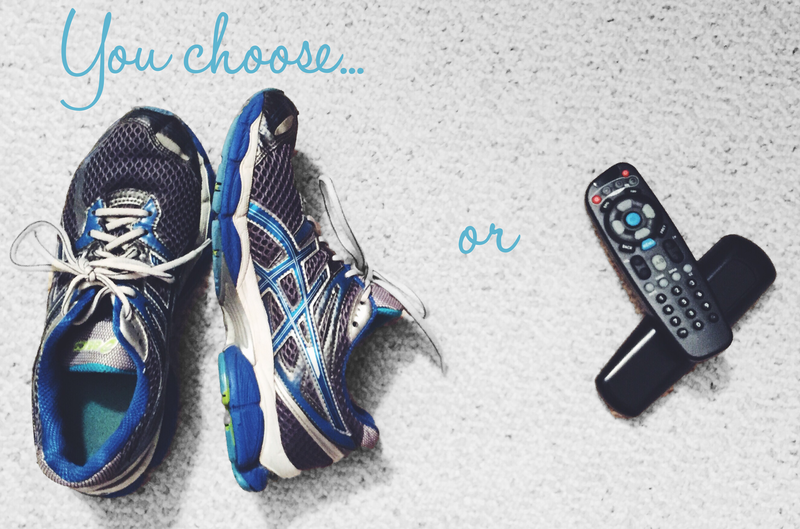 How do you keep motivated to exercise? Next postExciting feature on Confetti & Curves! I love that quote, “Exercise to stimulate, not annihilate”. Great post, thanks for sharing! 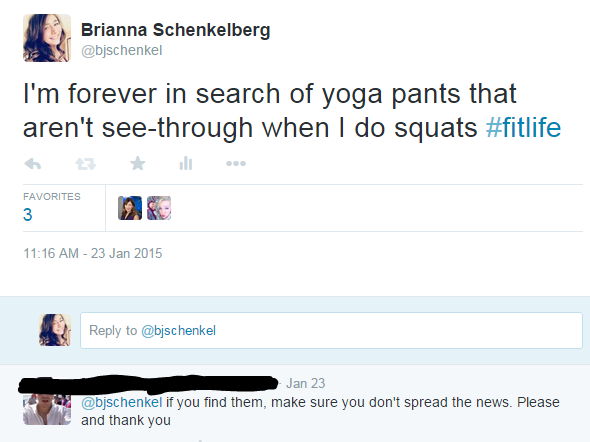 I LOL-ed at the see through yoga pants comment. too funny! I definitely think letting others know about your goals helps with accountability. Thanks for linking up today! Yes! I just got a new gym outfit this week and seriously had an awesome workout! And I’m with you on switching it up to keep it interesting. 3 months seems like the perfect time range to freshen up the routine.